My recent journey through the Autoimmune Protocol landed right over my birthday. A girl needs dessert on her birthday, right? Since I am a Type 1 Diabetic, I did not pursue an AIP compliant cake. It would likely be based in arrowroot flour, cassava flour, or coconut flour. The first two being so high in carbohydrates that I try to avoid them in recipes as they cause my blood sugar to sky rocket. 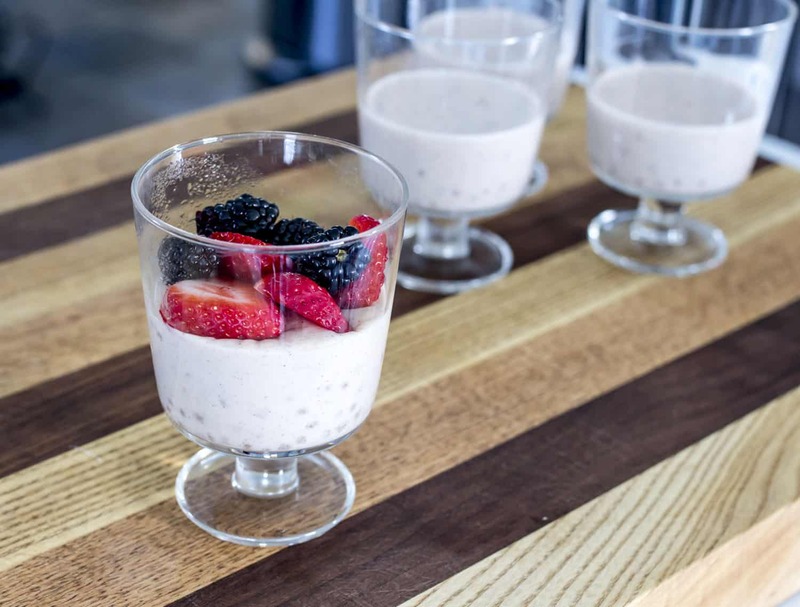 In my efforts to find a sweet treat that doesn’t raise my blood sugar too much, I created this recipe, Maple Cinnamon Tapioca Pudding. Let me take you back to the beginning. Once I realized my birthday fell during the Autoimmune Protocol, I was initially deflated. Creme brulee is my all-time favorite dessert and my go-to for my birthday or special occasions. 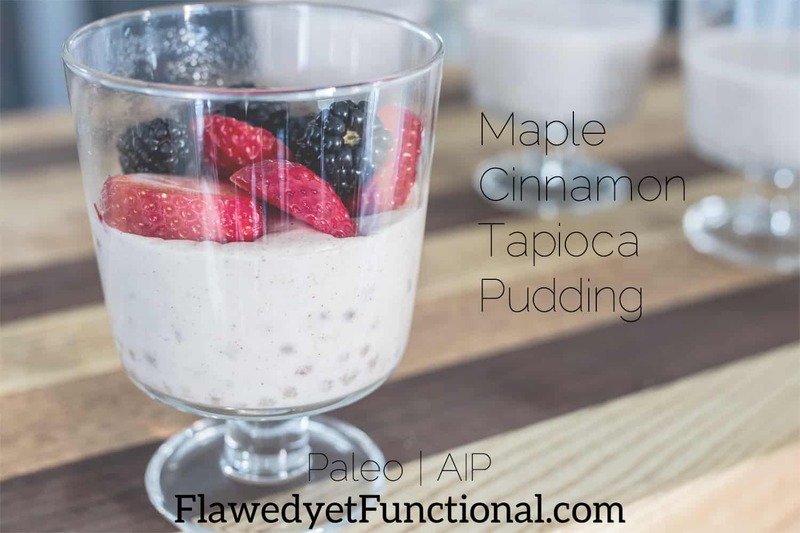 Dairy is a no-no for me right now, so I did what any girl would do, head over to Pinterest to see what would come up for “AIP Desserts.” Shockingly, the first one to pique my interest was an AIP-compliant tapioca pudding. I wasn’t sure if I liked tapioca, but I LOVE pudding (and it is extremely similar to creme brulee! ), particularly homemade pudding. A fond memory from my childhood is still warm chocolate pudding cooled just enough to form the layer of “skin” on top. Mmmmm…this might make some texture people cringe, but I love it! I gave the original recipe a go, and it was good. It struck a light bulb in me though, and I decided to experiment a bit with this dessert to make it suit my palate better. I tweaked the original recipe a bit to create my own version: AIP Compliant Maple Cinnamon Tapioca Pudding. Cinnamon is a delightful spice that can be savory or sweet. To up the sweet cinnamon flavor in the pudding, I put a half a teaspoon of cinnamon in the pudding right from the beginning. Cinnamon compliments the maple syrup very well. Then I topped the pudding with fresh berries: blackberries and strawberries. The berries up the sweetness factor but they are lower on the Glycemic scale making them a better addition for a sweeter dessert than adding more maple syrup. My other tweak was to up the maple syrup flavor. I chose to use Grade A maple syrup as my sweetener because that is what I had on hand. However, the maple syrup flavor was not intense enough for my liking. I really wanted the maple flavor to shine though so next time I will use grade B for more maple flavor and nutrients. In the absence of Grade B maple syrup, I chose to add some maple extract to the pudding. In this way, I got a more robust maple flavor without adding more sugar. I tried to keep the maple syrup as low as possible so the dessert wouldn’t raise my blood sugar as much. Cook the pudding until the outside of the tapioca balls are translucent but the middles are still white. They will continue to cook as they cool. Add any flavors or seasoning before beginning to cook the tapioca. 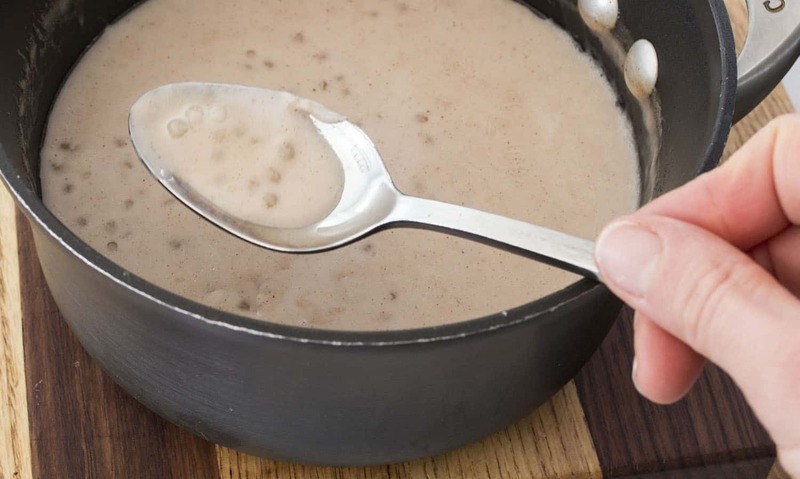 If you add it at the end, or just adjust by adding more, the stirring, after removing the pudding from heat, will disturb the tapioca balls. The suspension will break, causing the balls to fall to the bottom and form large lumps of tapioca. No good. Don’t do it. Enjoy this recipe as is or top with fresh berries. Strawberries and blackberries were looking great in the stores this week, so that’s what I put on top! Just in case you think this flavor combination odd, in my pre-diabetic days, my husband would make homemade berry syrup on Saturdays to go with our traditional pancake breakfast. Do you know what makes a strawberry or blueberry syrup killer? Cinnamon. No joke. It will take your homemade syrup to whole new level. Add a half a teaspoon to your syrup then taste and adjust. It is delicious! 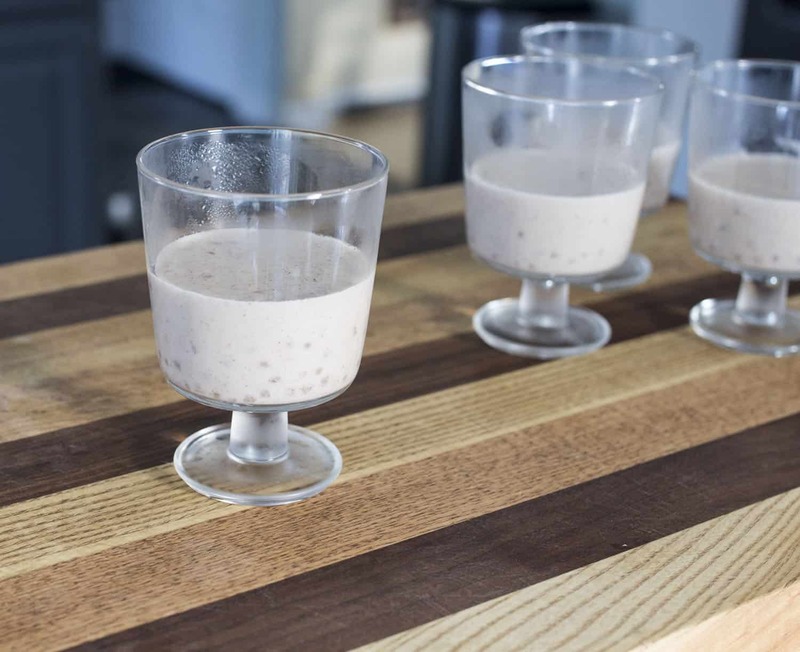 Maple Cinnamon Tapioca Pudding is gluten-free, grain-free, and dairy-free. 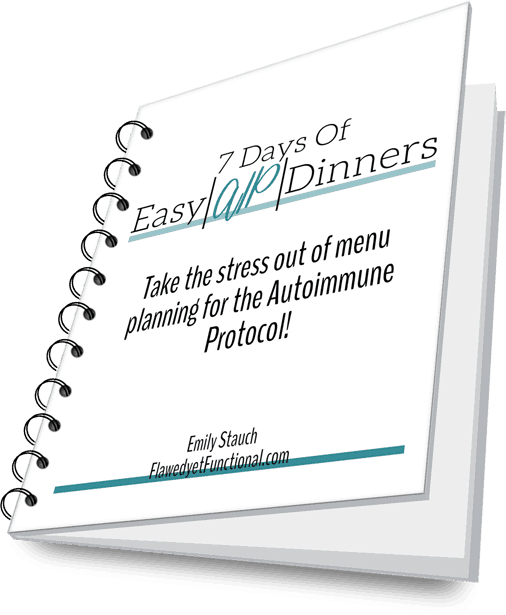 Proof that when you are on the Autoimmune Protocol, you can have your cake and eat it too! Enjoy! 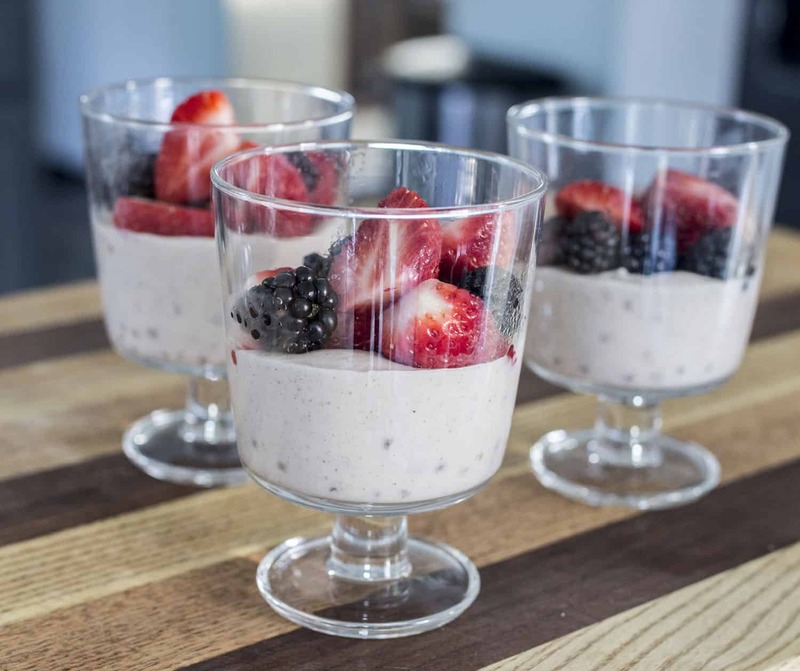 A tasty AIP, Paleo dessert that is dairy-free, grain-free, and gluten-free. 1 Tbsp maple syrup, grade A Grade B is preferable, if you have it. Soak tapioca pearls in the filtered water for 1 hour in a small saucepan. After soaking, add the rest of the ingredients to the sauce pan. Stir to combine. Over medium heat, bring tapioca mixture to a simmer. Reduce heat to low, maintaining a simmer. Cook, stirring frequently, until tapioca balls are partially translucent, about 10 minutes. If the pudding starts to stick to the bottom of the pan, reduce the heat. Remove the pudding from heat and pour into individual serving cups or ramekins. Eat plain or topped with fresh berries. This recipe has 17 carbs per serving.